I think, as I have said before, that anyone who wants to marry should be able to do so. Well, OK, maybe if you want to marry a horse or something along that lines, where the other “individual” cannot intelligently agree to the contract, should not be legal. But if my friend Justin wants to marry his sweetheart, he should be just as entitled to do so as I was to marry mine. A marriage, legally speaking, is a contract, pure and simple. There may be a religious component associated with it, if you choose that, but you get your license from the government and the government is endorsing the legal nature of the contract when the license is signed and registered. No marriage is legally recognized without that contract. And telling a gay couple that they cannot legally enter into a contract because some religious people disapprove of their union is just crap. My husband’s grandmother would have disapproved of our union – I was married before and divorced, and she was a devout Catholic. That shouldn’t mean we can’t get married, it means holidays would have been a little more stressful for us. I think the Supreme Court really did two very bad things this week: upholding the ACA in its current form, and their crafting law illegally on gay marriage. In both they violated both precedent and the democratic process. And they have destroyed their legitimacy for probably a majority of the citizens of this country by one, or both of these rulings. I have to say that my previous article about the Gay Marriage ruling has to be one of the most popular I’ve written, at least in terms of likes. Which surprised me, but then the things I think people will like seem to be ignored and the ones i think they won’t care about tend to get the most attention. Go figure. Genius, I tell you. Pure Genius (this Dr. Crawford, not me). Reblogging because for the most part it’s still true. Community, Personal Responsibility, The World Isn’t Fair, Gods. Atheist alert: this has a lot to do with spirituality and yes, religion. Deal. In my mind science and ‘woo’ co-exist in a dynamic relationship that causes occasional cognitive dissonance, but forces me to continually re-evaluate my worldview. In my view this is healthy and necessary. Pagan alert: Not Politically Correct Commentary on our community. Deal. If it angers you, perhaps you need to take a good hard look in the mirror. I’ve been through the wringer for the past six months. In that time I have been places that boggle the imagination. I’ve been a specimen under a microscope. I’ve been betrayed on a fundamental level by those closest to me, and by some of the very systems our society is predicated on as well. And. The truck was stolen, trashed, totaled, rebuilt. I lost a job. I spent money I didn’t have (thanks FIL for the help, more grateful than you’ll ever know) and am in debt to the tune of thousands of dollars with nothing to show for it. I have a degree for a career I can’t work in. And I’m becoming more and more convinced I don’t want to work in it anyway, the way things are moving (see going places one doesn’t want to go, or my previous post). I have discovered, the hard way, that standing up for right doesn’t always mean you will be protected, or that things will work out. Sometimes you will be punished in the worst ways imaginable, and evil WILL prevail in spite of an individual’s or a community’s best efforts. I’ve maintained a minimal level of spiritual practice through this, even if it has been nothing more than a simple acknowledgement of Deity and thanks for getting through another day. It has been nothing approaching the level of an actual devotional practice though, and I’ve felt that lack ever more keenly as I approached the end of my degree program. Once I finished, and had nothing else to occupy my mind but the drama and tragedies of life, it became a yawning chasm that contributed to my ennui and depression. I literally couldn’t summon the energy to pray, let alone believe it would work. I felt as though I just wasn’t worth it, that the Gods had better things to do than deal with me. I believe in synchronicity. I believe in the fractal nature of the universe – As Above, So Below. I do believe that there are other entities, other dimensions, other realities than our own see/taste/touch/hear/smell reality, and that sometimes we reach out to those other entities/realities – and other times they reach out to us. I believe that things often happen for a reason, and that reason sometimes isn’t readily apparent for a very long time, if ever. This faith was seriously shaken as a result of the happenings since January. My children are fundamentalist Christians. Two, at least, were Pagan/anarchists earlier in teenaged life. I believe that they became Christians not because of the actual religion, but because of the structure and community it offers. This is something that very little of modern NeoPaganism offers, and I have seen that over and over and over again in the nearly 20 years I’ve been a Pagan. In nearly 20 years as a Pagan, I’ve met more people who are trying to get on disability than I ever thought possible. I’ve met people ON disability who constantly cried about how poor they were, and who were no more disabled than I am, who ran side businesses based on cash to augment their disability payments and who actually had nicer things than Mr. TF and I do. I’ve met people who can’t keep a job, who can’t keep a relationship, who can’t keep an apartment, who can’t keep a car, who are using/abusing illegal drugs – and I’m not talking about marijuana here people – or who are abusing prescription drugs. When I worked in the ER I saw more than one person – significantly more than one – I knew from the local Pagan community come into the ER for problems directly related to prescription or illegal drug abuse or as “seekers.” It made for uncomfortable questions from fellow staff members, at the very least. Many people who are drawn to the Pagan path often tend, in my experience, to be less than reliable on a personal level and tend to make very bad choices. These bad choices are ones for which they tend to not take responsibility. They misuse magick, in my opinion, as a tool to overcome lack of personal responsibility for bad choices rather than as a tool for self-development. Or they use it as a substitute for an actual spiritual relationship with Deity. Magick does NOT substitute for spirituality. And one does NOT need to do magick to enter into a relationship with Deity. Magick is a tool, it can sometimes be a vehicle, but it’s not the object (unless you are a Ceremonial Magician which is another conversation entirely). It’s as though they are drawn to Paganism because they perceive it as the one religion/practice for which they have to take no responsibility, and they can espouse beliefs that NO ONE can tell them are wrong. Cuz personal gnosis, you know. Because of my experience (and that of my husband as well, I am writing this as an individual but we have shared this conversation many times between ourselves) we have mostly withdrawn from participation in and organization of Pagan events, particularly events like Pagan Pride, public Pagan holidays, Pagan meetups….you get the idea. The embarrassment of being associated with the crazies just simply began to outweigh the benefits of the participation. And yes, I know there are those in the Christian community as well. However, they tend to be reined in by those who are around them, and either drawn into the fold or shunned. They are self-selecting in their long term participation. As a side effect of withdrawing from public gatherings, my own spiritual practice has suffered – it’s not just the business of life/school/work/stressors, it’s been that I no longer go to events where I can get my spiritual batteries somewhat recharged because I’m participating in a community of believers. The very thing my children currently have. The thing I envy, even though I do not think a patriarchal herding religion from a desert region from 2000 years ago has any relevance for them – or for me, for that matter. I do ‘get’ why they turned away from a religious practice that *did* and *does* have relevance for them (and me). Because community. It’s important. I have suspected for quite some time that the Pagans who were serious about their practice, at least in our area, were very secretive, or at the least insular, mainly because of the above. They are responsible adults and take their religion and spirituality very seriously, and they don’t want to associate with people who don’t. So, while believing firmly they’re out there, it also makes it very hard to find or connect with them. Friends of course excepted, but because of school/work commitments it’s made it hard for us to connect with them as well. When we’re all on different schedules and none of them coincide for all of us….you get the idea. So why am I going on and on about this? Because I am going to a Pagan event for the first time in nearly a decade next month. I’m terrified. And excited. I don’t know if Mr. TF will come or not. He’s much more laid back about his spirituality, and doesn’t feel the need to actually connect the way I do – at least to hear him tell it. And the way I found out about this event is nothing less than synchronicity. It’s a Rube Goldberg nest of interconnected coincidences that defy logical explanation. It’s not just any event though. It’s a Heathen event. I’ve shied away from heathenry for my entire time as a Pagan due to bad press about skin heads and racists who identify as heathen. I didn’t, and don’t, want to be associated with those who think the color of one’s skin denotes one’s worthiness to worship the Old Gods. When I first became a Pagan (or more realistically, realized that my spiritual beliefs were Pagan and I just didn’t know it) I was strongly advised against my interest in Norse spirituality by a Pagan friend who had recently spent 10 years in prison. His experiences there didn’t encourage me to try to follow up. But recently I’ve been forced to rethink my blanket painting of this community thanks to blogs and websites devoted to heathens, as well as books I’ve had (and read previously) in my library. A recent re-reading of them revealed nothing that actually allows for this view, regardless of the views of a certain vocal percentage of heathens. And as far as I’ve read (which isn’t a lot, but also not nothing), there’s nothing in the lore that allows for this view either. As I stated earlier, I believe in synchronicity. And I believe the Gods call who They call. Regardless of skin color. are the same values I live my life by, and I want to associate with people who share my spiritual outlook as well as my ethics. 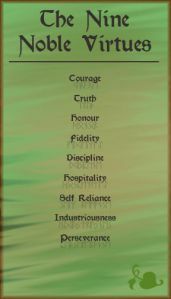 ETA: because it doesn’t embiggen: Courage, Truth, Honor, Fidelity, Discipline, Hospitality, Self Reliance, Industriousness, Perserverance. I am hopeful that I can find a group of people with which to share community and spirituality. Gods know I’m ready after the half year I’ve had.